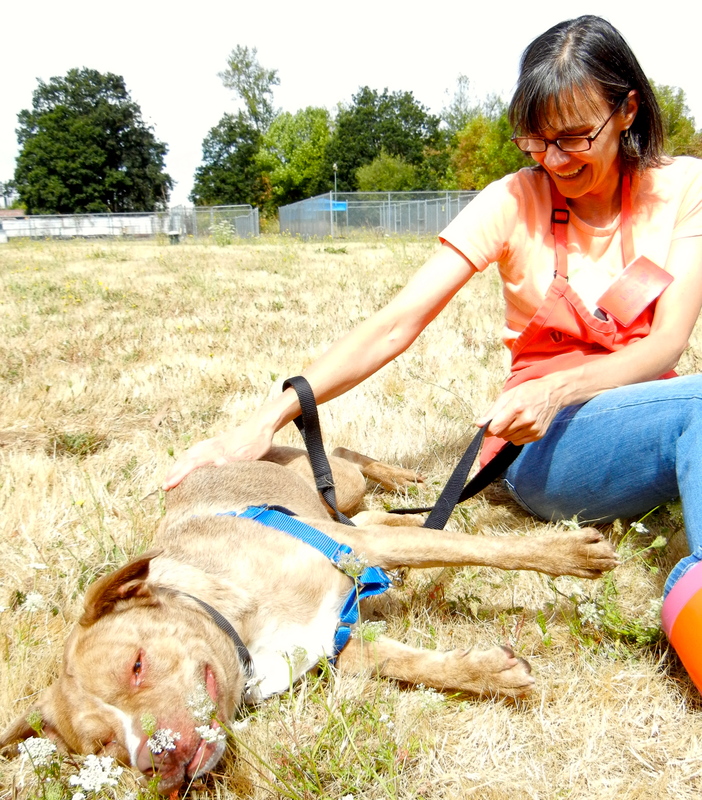 If you read last week’s post, you will remember the touching Delilah story. Well, I’m thrilled to report a happy ending. Delilah was adopted last week! 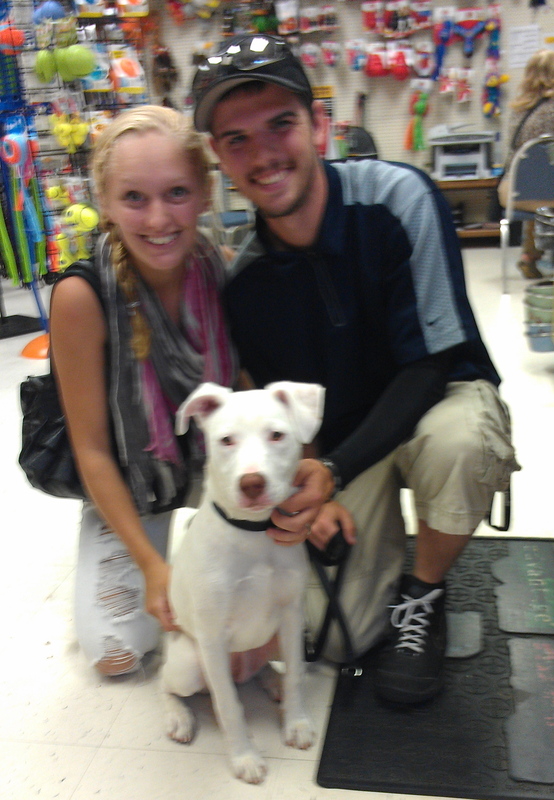 Here she is with her new forever family who fell in love with her the moment they met her! 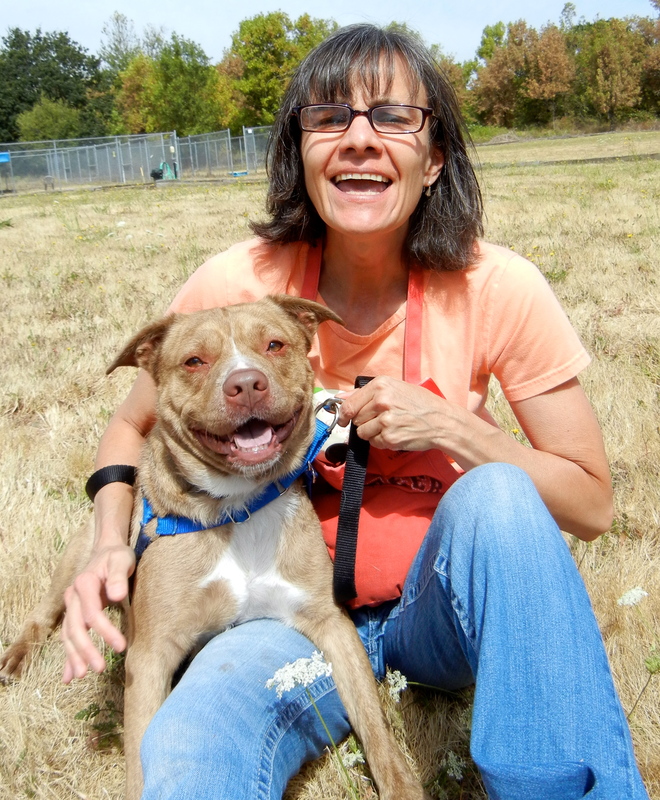 Her former owner now knows that she got a wonderful new life in Oregon. Besides Delilah, there were lots of other adoptions during the past week. 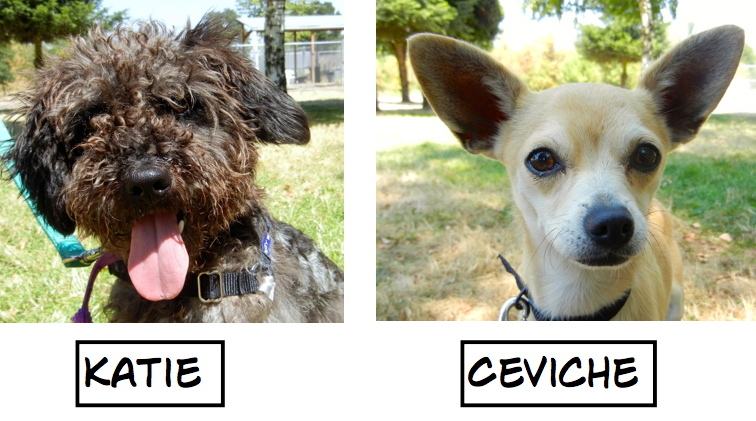 Here are all the Blog Dogs who found new homes. 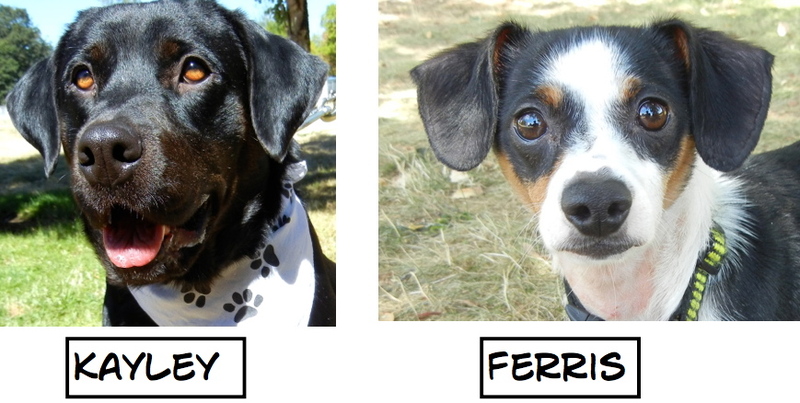 I want to mention one other adoption. Suket, a six-month-old Lab mix, arrived at WHS as a transfer from another shelter. It wasn’t long before staff realized she was deaf. 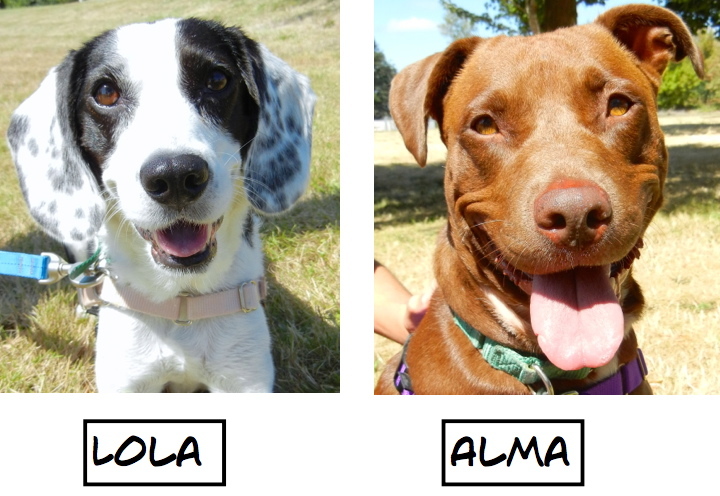 On Sunday a family with deaf members came to the shelter looking for a dog. Everyone in the family knows ASL (American Sign Language), as does Suket. 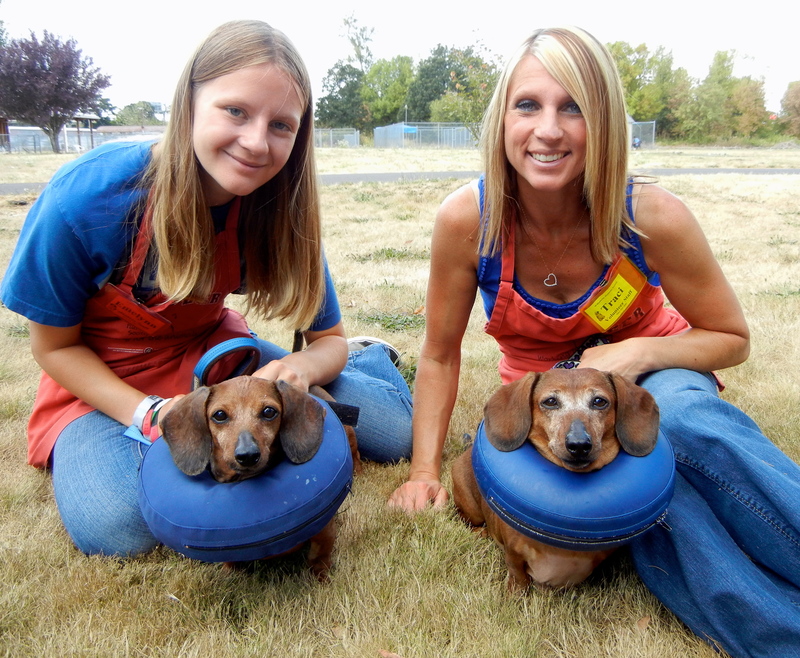 They had previous experience with deaf dogs, as well. You know where this story is going, don’t you? I didn’t even have a chance to get Suket’s picture before she was adopted! Her new name is Hope. Kim got a quick photo of the happy family just before they went home. Summer play groups are especially fun. 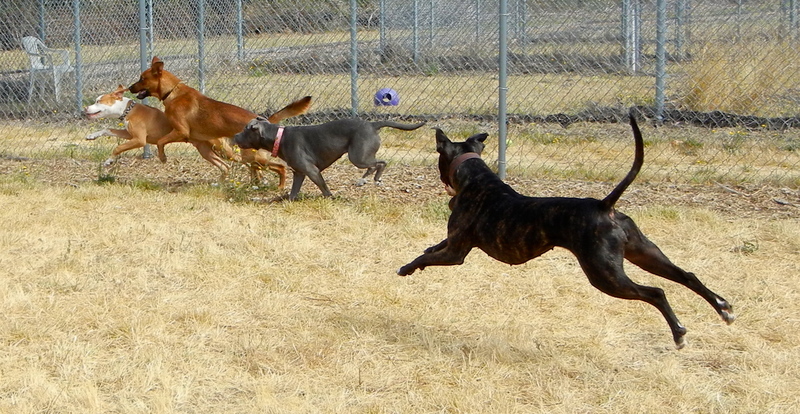 Last week the dogs raced around playing, often giving play bows to each other. Here are some of the remarks I overheard. 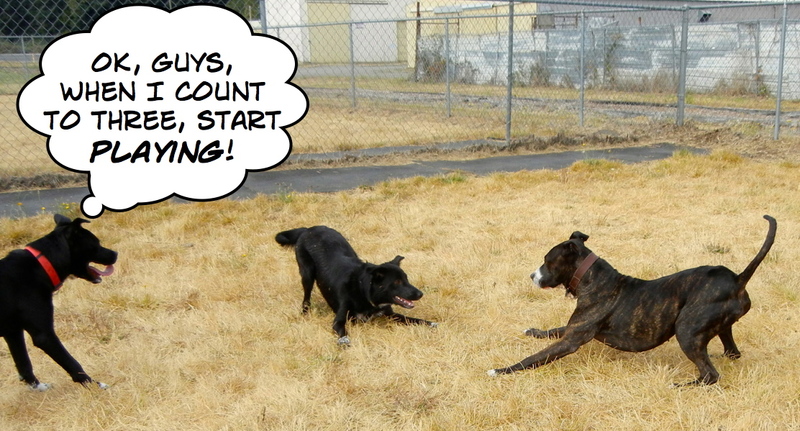 It’s really cute when both dogs give play bows before starting a chase game. Do these guys look happy, or what?! Remember Daphne, the shy Border Collie who came to the shelter a few weeks ago, sad and confused? 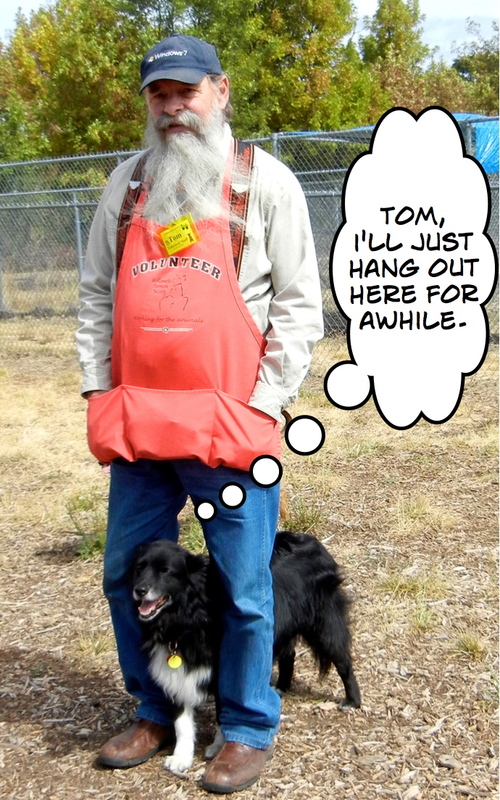 Volunteer Tom adopted her and as you can see, they have totally bonded! Marley was giving play bows to everyone to see if they wanted to run with her. Mamie chose not to. 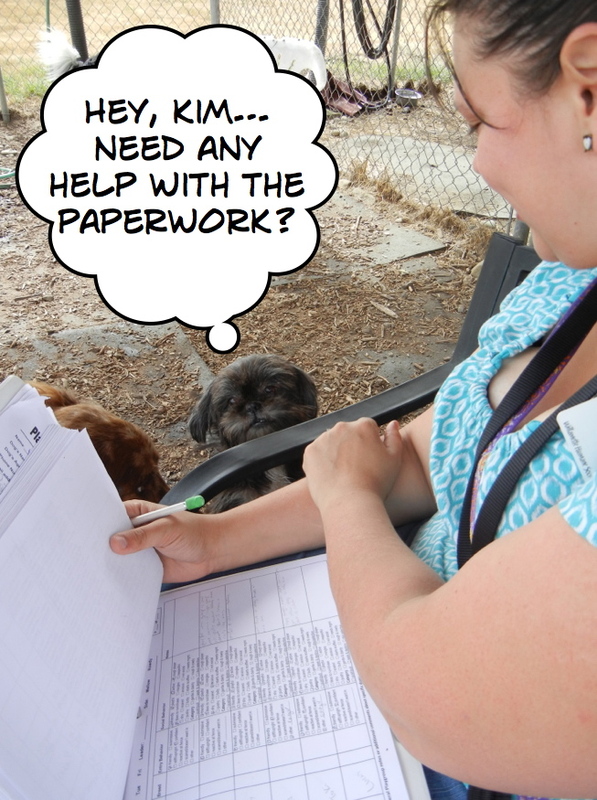 Little Astrid was anxious to be Kim’s assistant. This picture needs no bubbles…just dogs loving running together. Last Saturday, fellow volunteer Beth and I had an especially fun afternoon that we’d been looking forward to for months. 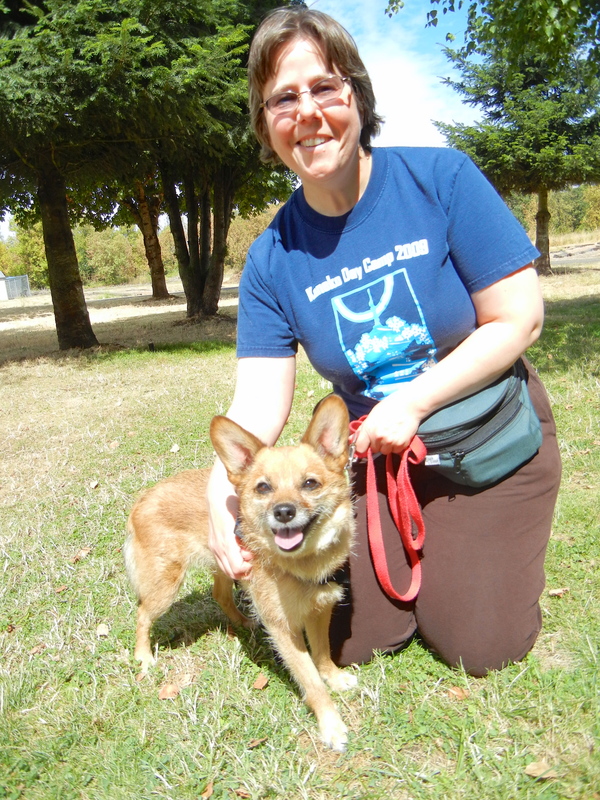 Liz and Tana, two volunteers from the Crescent City Pound in California, took a day-long road trip to visit us and WHS. 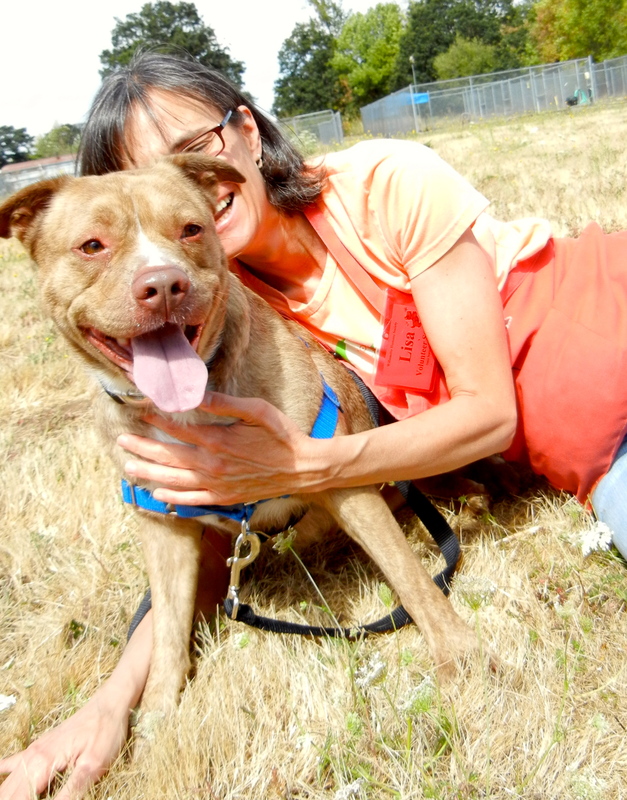 Beth and I had become “Shelter Buddies” with Liz and Tana over the last few months when WHS took in some of the Crescent City dogs who had been at their shelter for a long time. 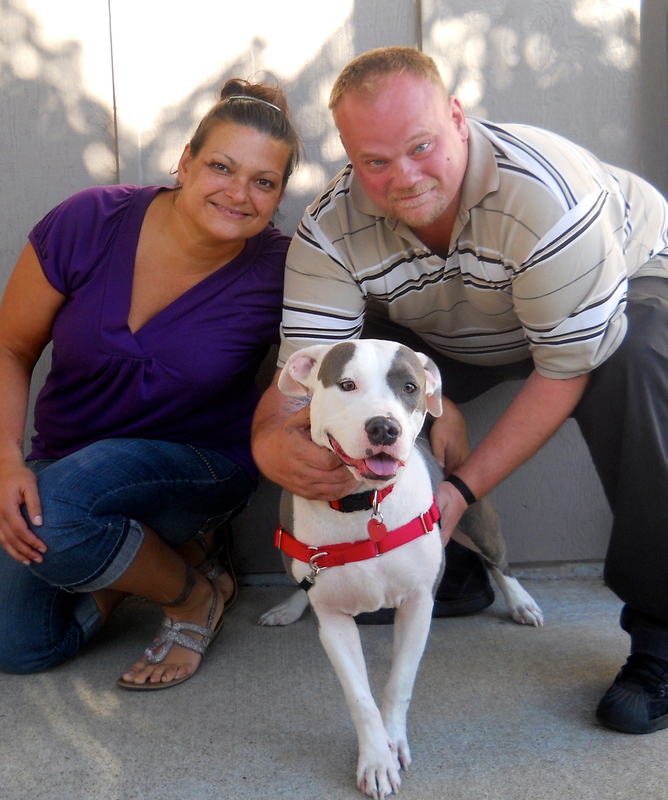 The latest success story was Brady, a CC dog for ten months, who was adopted two weeks after arriving at WHS. 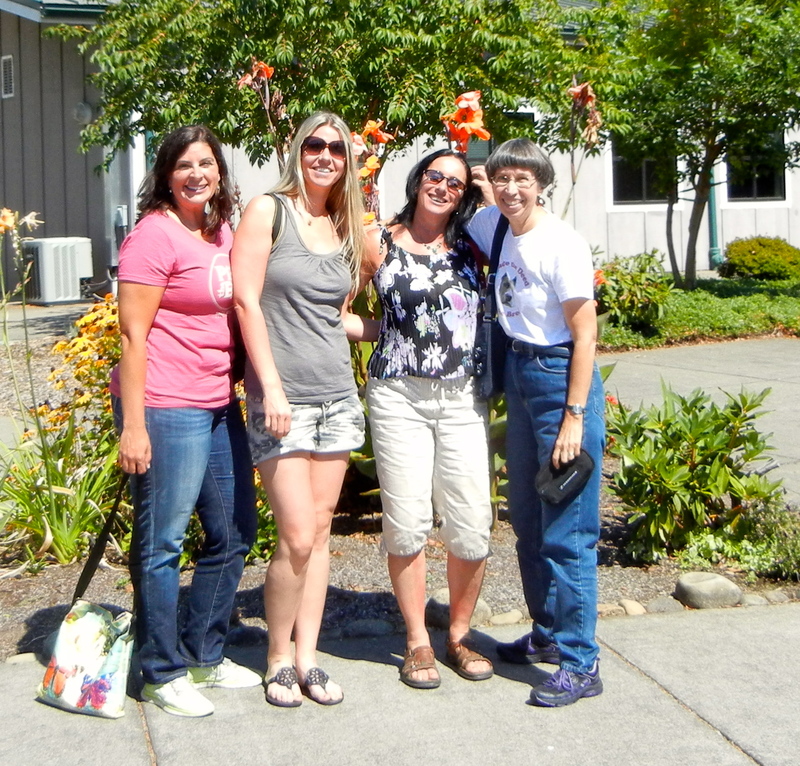 Liz and Tana arrived in Salem around noon. After a fun lunch and non-stop gab session about dogs, we gave them a tour of WHS where they met staff and other volunteers. Here we are outside the building. 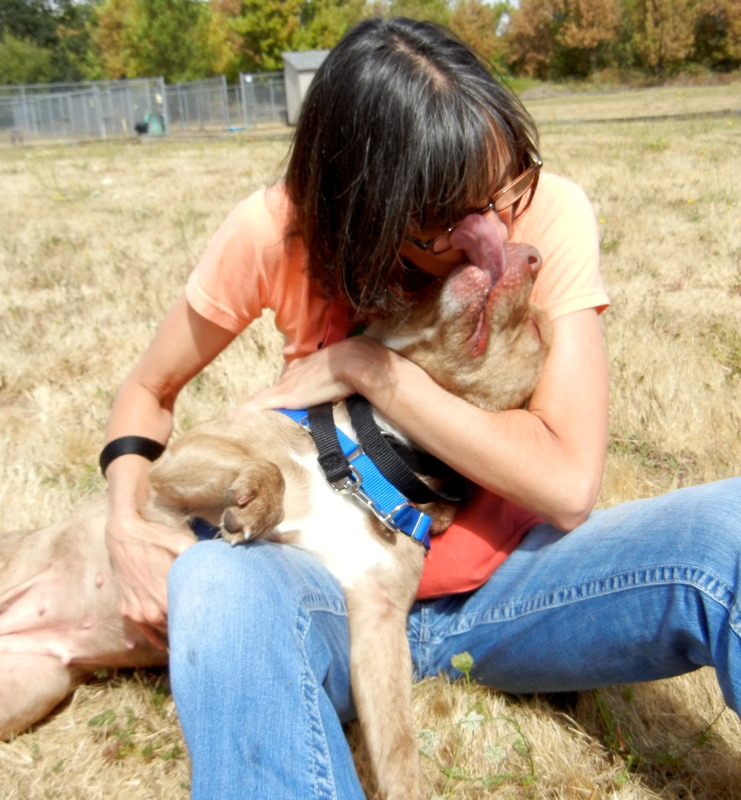 Our common love of shelter dogs made us feel like we had been friends forever. We look forward to getting together again. While getting caught up on new dog pictures Sunday afternoon, I took some shots of walkers. 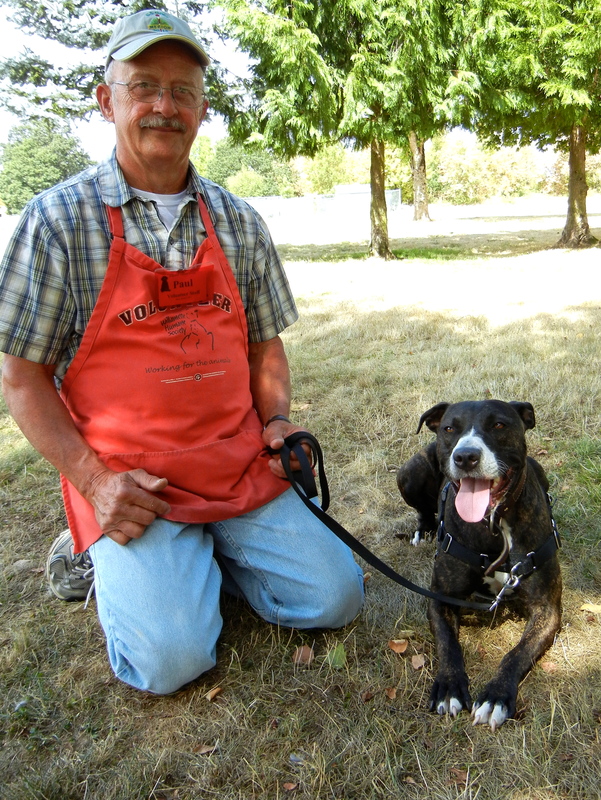 Here volunteer Paul is with new arrival Brooke, a two-year-old Pit Bull Terrier mix. He is a polite, quiet fellow who loved my hot dog bits and eagerly sat on command for them. 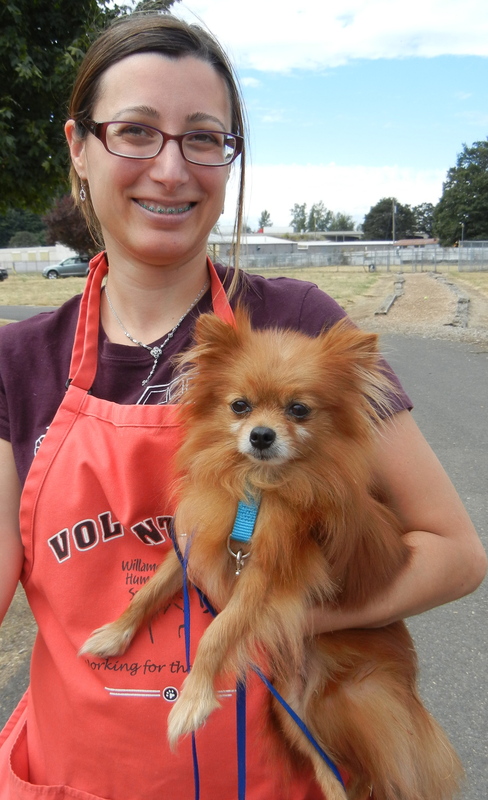 This is Tiki with volunteer Amey. 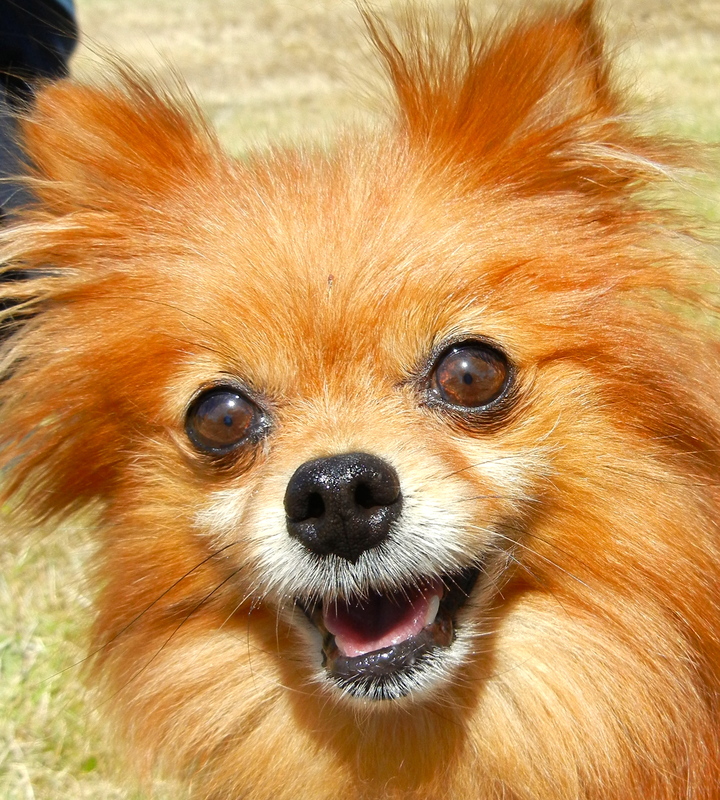 Tiki is a seven-year-old Pomeranian who needs a quiet home. She is averse to some touching, so needs a gentle and understanding person. She would love to be a couch potato and watch TV with her people. Short walks will do her just fine. 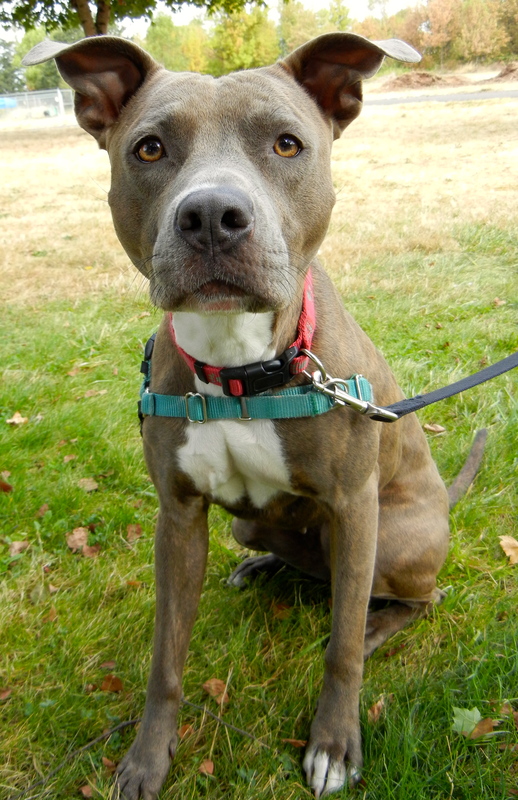 This beautiful girl is Marley, a two-year-old Pit Bull Terrier mix whose calm, polite manners won me over instantly. She sat on command, took my treats gently and posed for my camera willingly. As with most Pit Bull Terriers, her eyes speak from her heart. 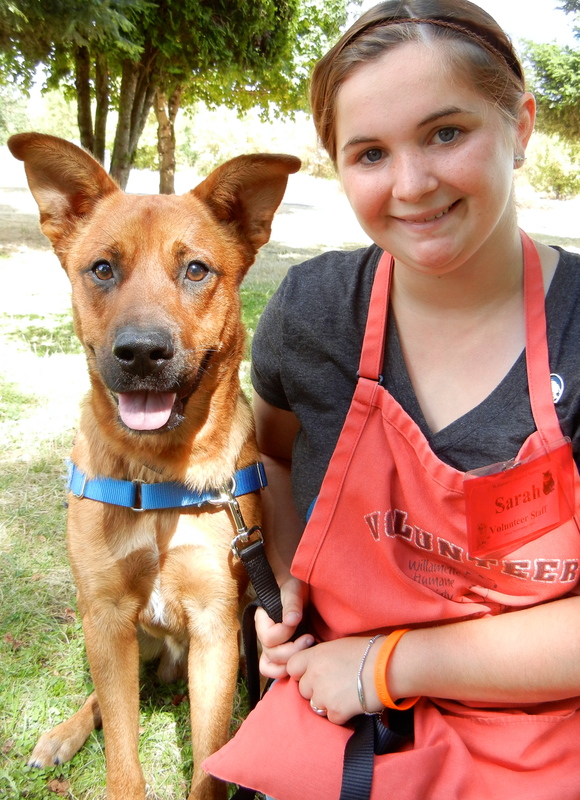 You will remember from last week’s post that volunteer Lisa spends a lot of time with Cassie. She often takes her for respites; she just returned today from a camping trip! 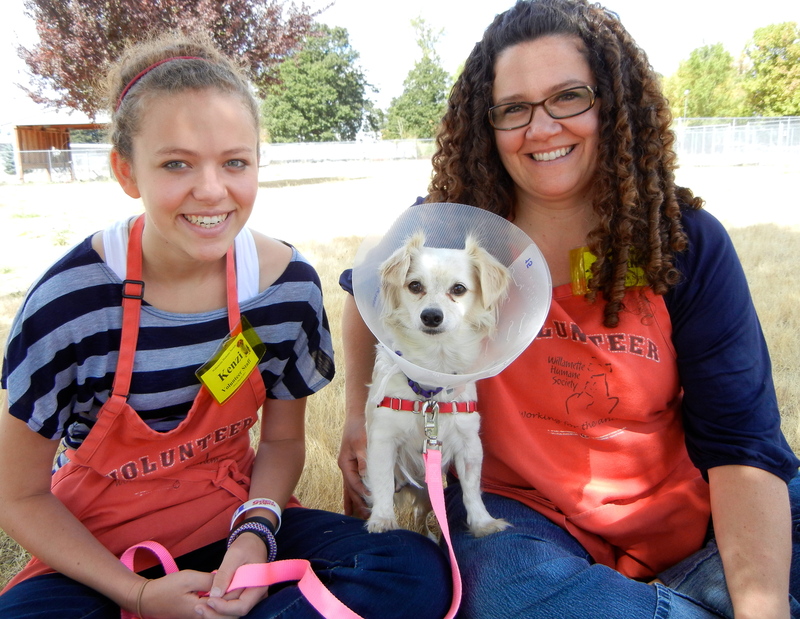 Cassie has become Lisa’s special project because Cassie has been waiting to be adopted since June. She is five years old. On Sunday Lisa came to pick Cassie up and before they left, I snapped these happy pictures. Cassie’s fans hope the right family will find her soon. I really liked my respite with Beth Ann! 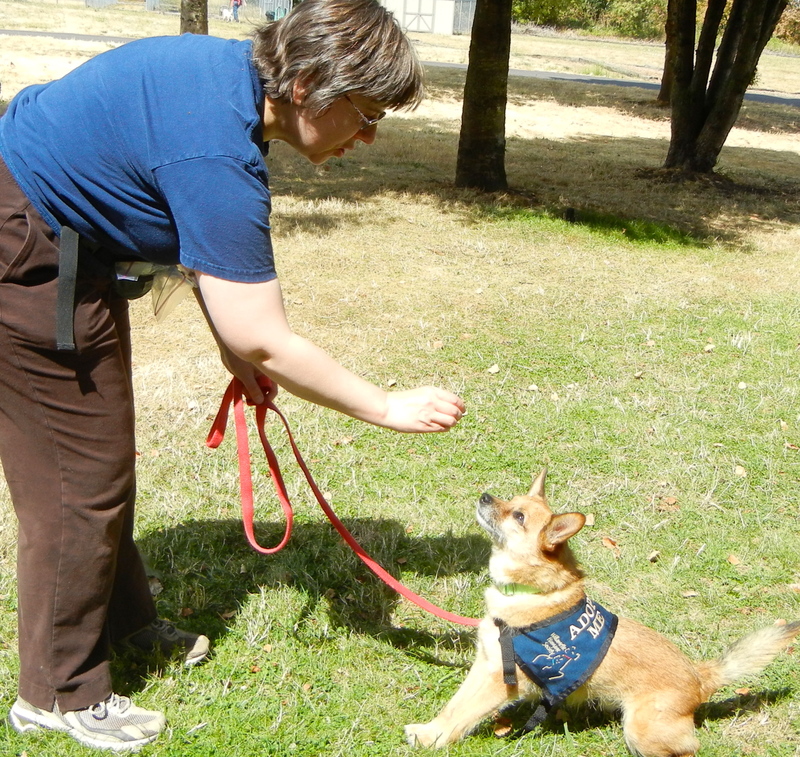 Also on Sunday, I happened to run into volunteer Beth Ann who was taking little Dingo to her home for a respite. 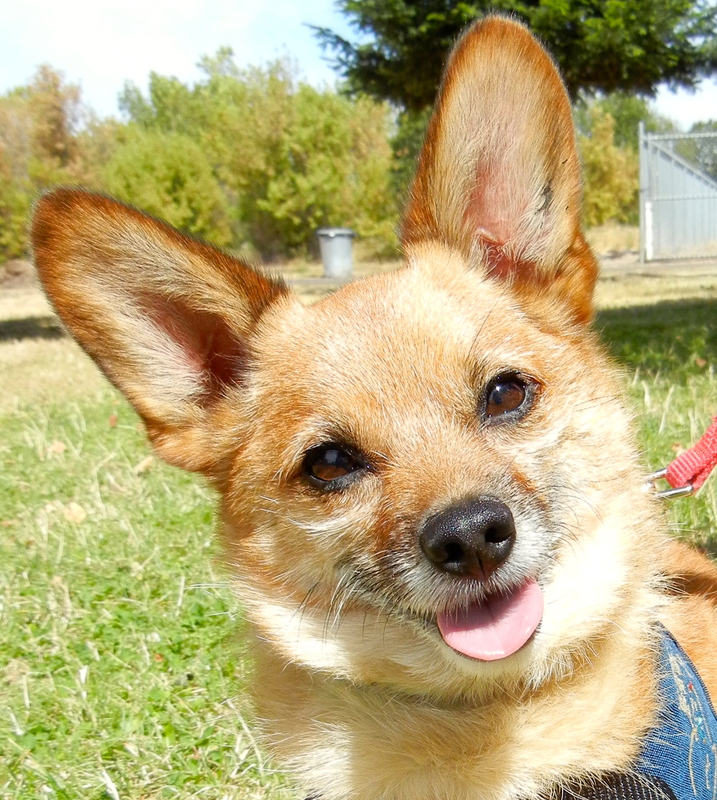 Dingo is a six-year-old Chihuahua/Pomeranian mix who is a delightful little character. Here he is with Beth before they left. And here is Beth’s excellent report and pictures from their time together. 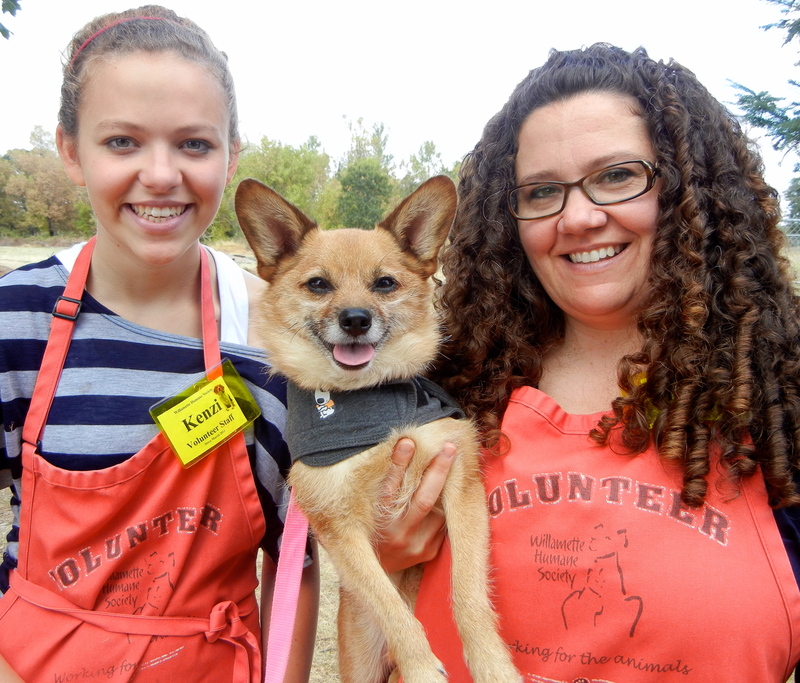 Here he is today with volunteers Meredith and Kenzi. My name may be a little odd, but it fits me! When I arrived at WHS this afternoon, Sarah was already spending time in a yard with Liftoff, a one-year-old Retriever/Collie mix who is a wonderful young boy. 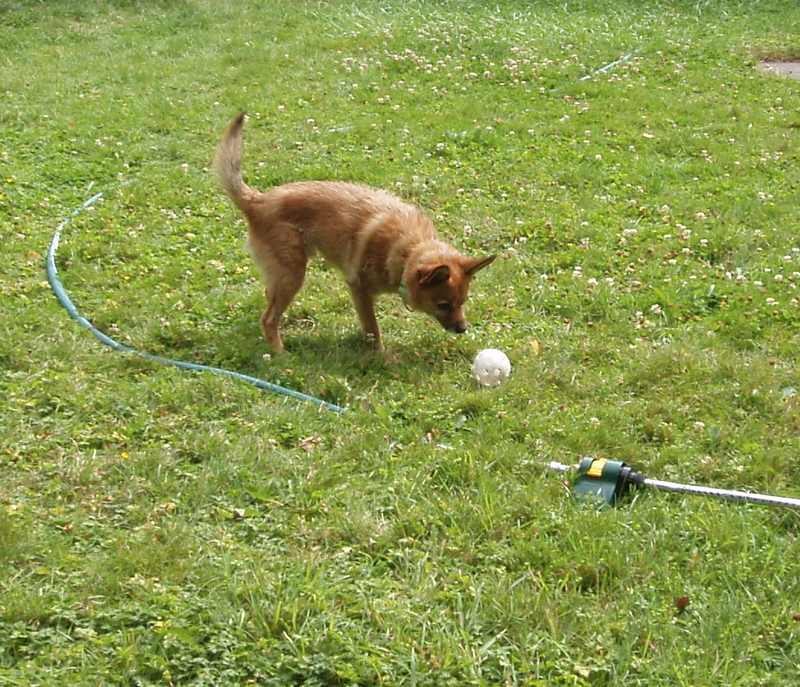 Sarah discovered he is a BALL DOG and will chase and return tennis balls for as long as you’ll throw them. 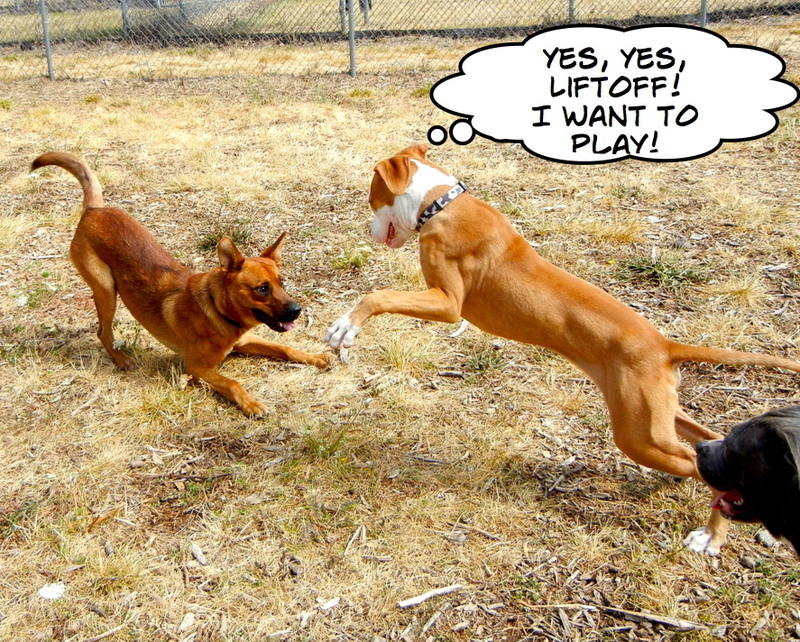 He also had a great time in play group (you saw his picture in the cartoon above) and was polite with the other dogs. He walks well on leash, took my hot dog bits nicely and happily posed for my many pictures. 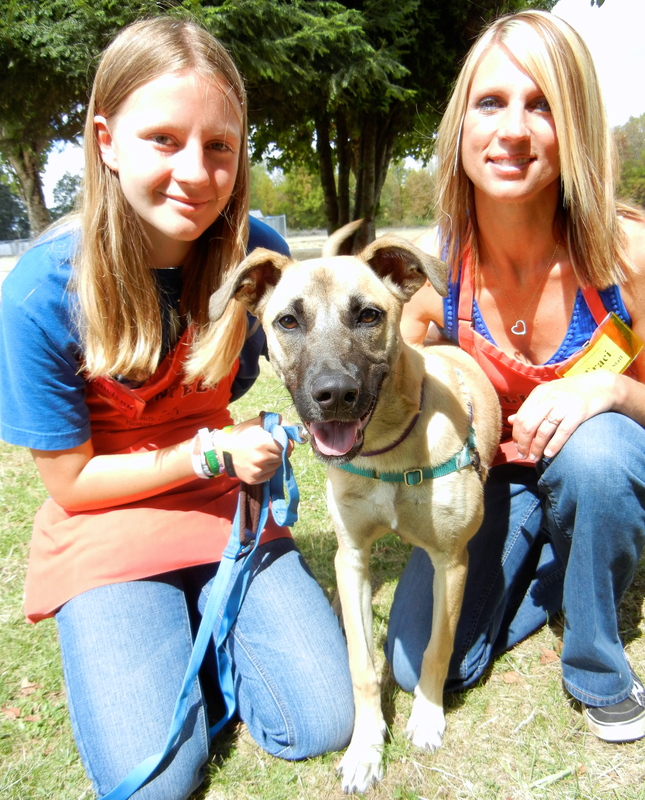 He will be a great jogging or running partner and would love to attend training classes here at the shelter. Some lucky family will adopt him soon, we hope! I got to walk with a new volunteer! It’s always fun to welcome a new walker to our Wednesday Volunteer Team. Today I got to meet Parker who will be walking the 4-6 time slot once school starts. One of his first “walkees” was little Astrid, a seven-year-old Shih Tzu/Pekingese mix with a slight under-bite. Astrid will make a great companion for a quiet home. 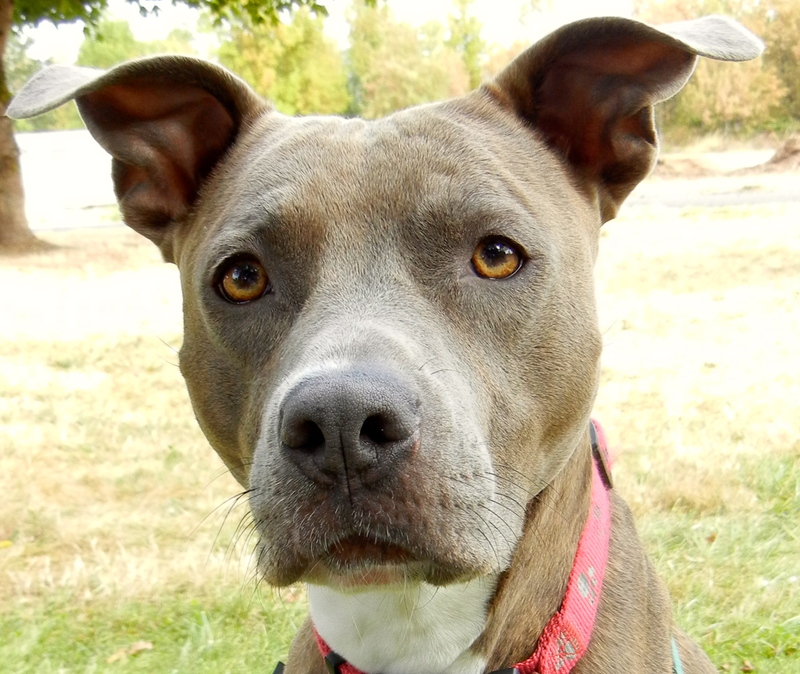 She would love to curl up on the couch next to you and would be good with kids. As you can see, she is a happy little camper! 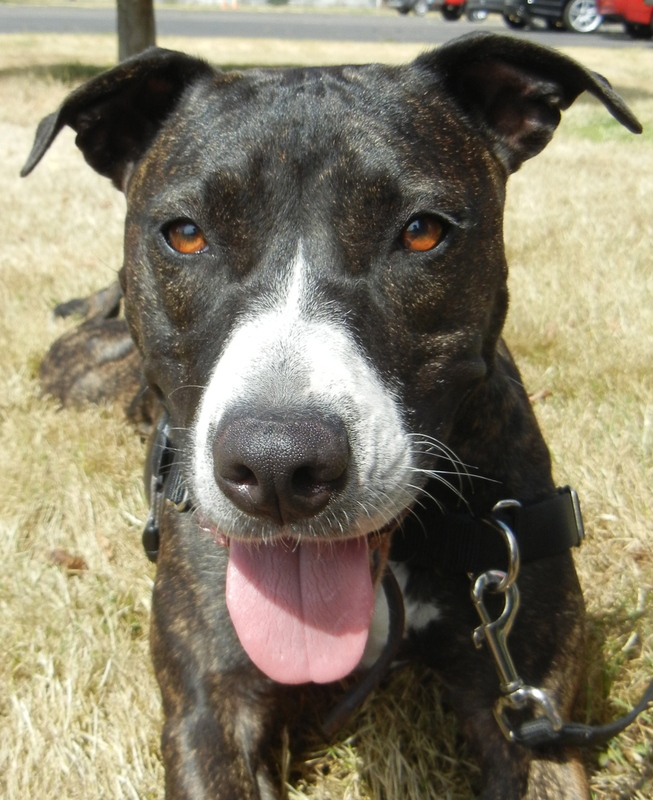 Looking for an active young dog to have adventures with? Take ME! 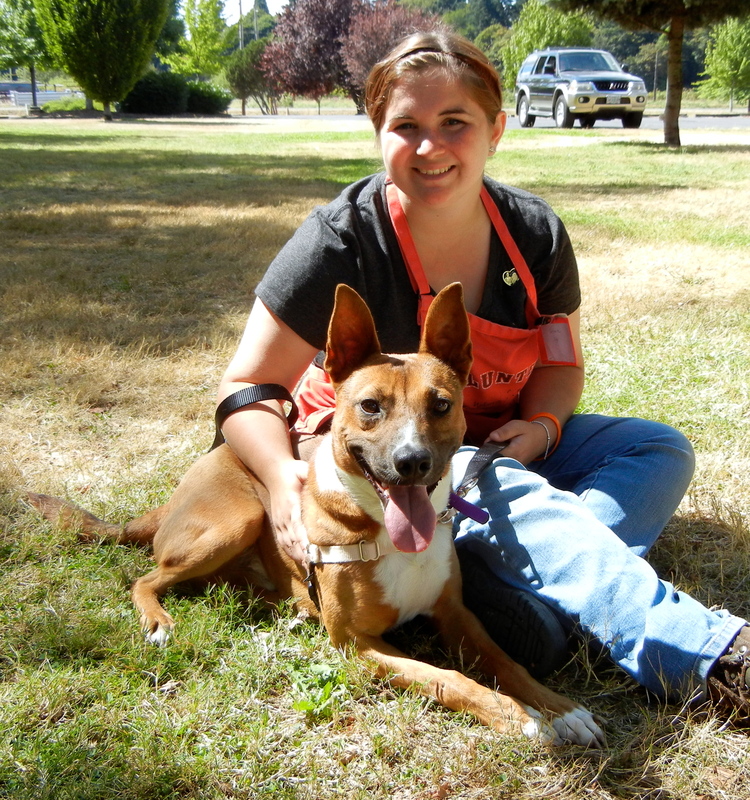 This is Arthur, a two-year-old Basenji mix, who is ready to GO! 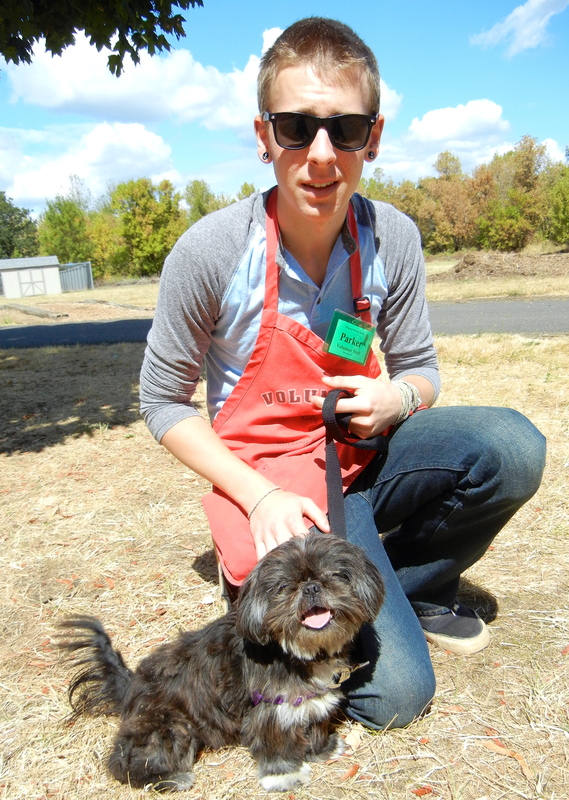 He would make an excellent student in WHS training classes, as he is a quick learner and eager for praise. He already knows some commands, and would like to learn more. He will be an active dog, so will need an active family. Here he is hanging out with Sarah this afternoon. Emelynn had no trouble deciding on her pick this week. 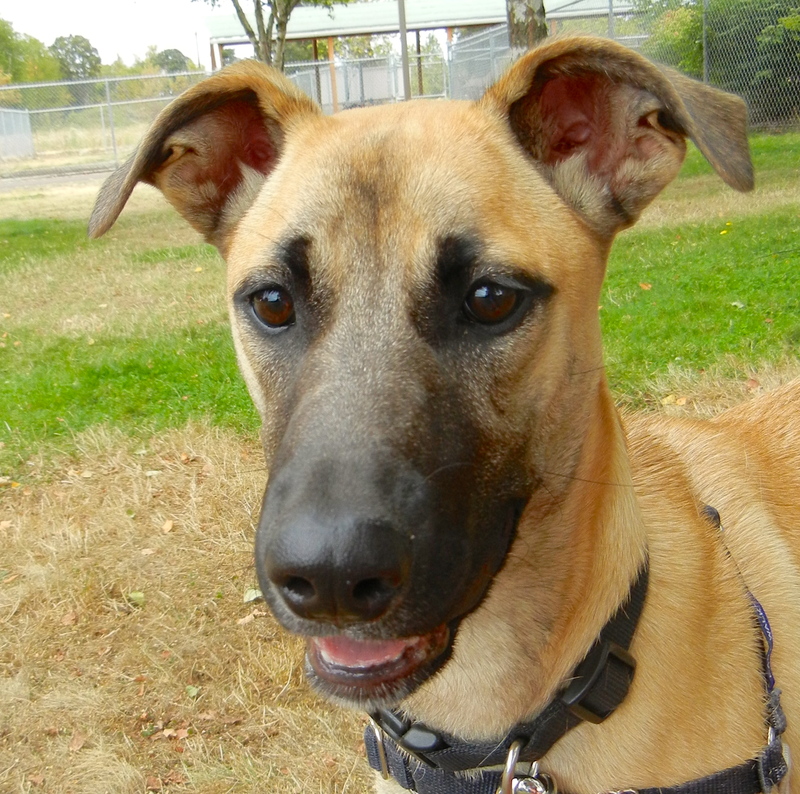 She chose Keeba, a Belgian Malinois mix. 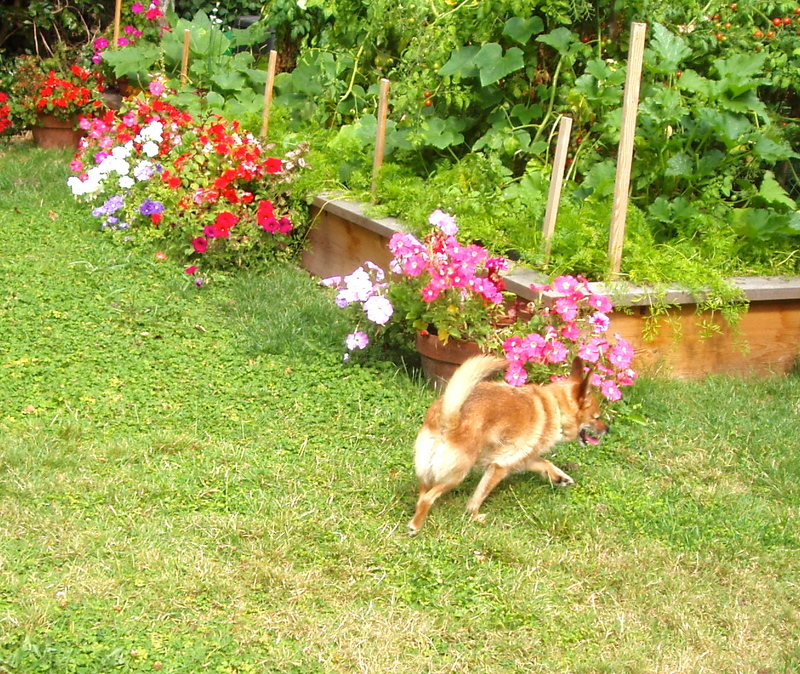 At ten months, Keeba is still very puppy-acting, so has lots of energy and few manners. She will grow up into a lovely dog, but will need an owner willing to work on training with her (remember, WHS classes are perfect for this!) and will need some patience. 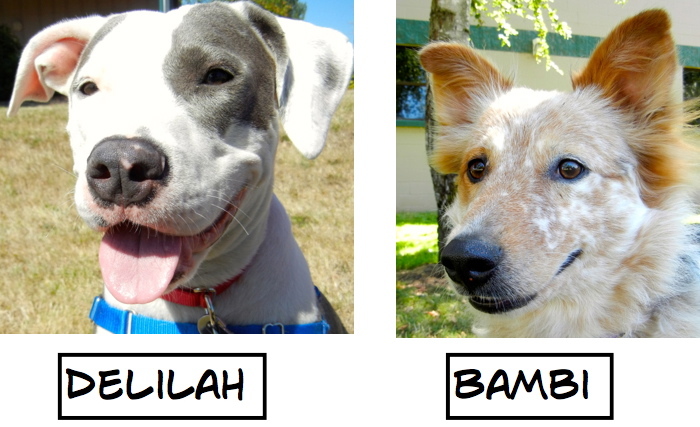 Here are some of the things http://www.dogbreedinfo.com said about this breed: They are ever watchful, alert and loyal. Belgian Malinois are good with children if socialized well with them. This breed needs to be part of the family and not locked up in a kennel. The name’s Mamie. I’m looking for a fun family. Are you it? Little Mamie was wearing a cone today, as she was just spayed. Even though she wasn’t thrilled with having to wear it, she was happy to spend some outdoor time with Meredith and Kenzi. 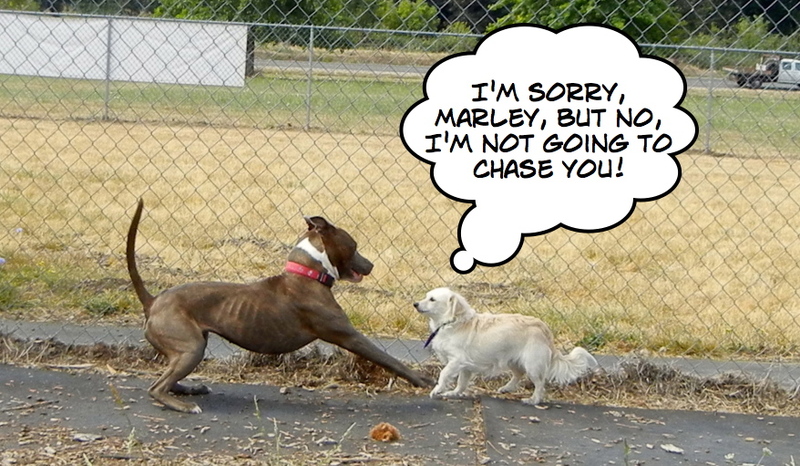 Mamie is a gentle, playful girl who enjoyed play group, but didn’t care to romp with the big guys (which she explained to Marley in the cartoon above). 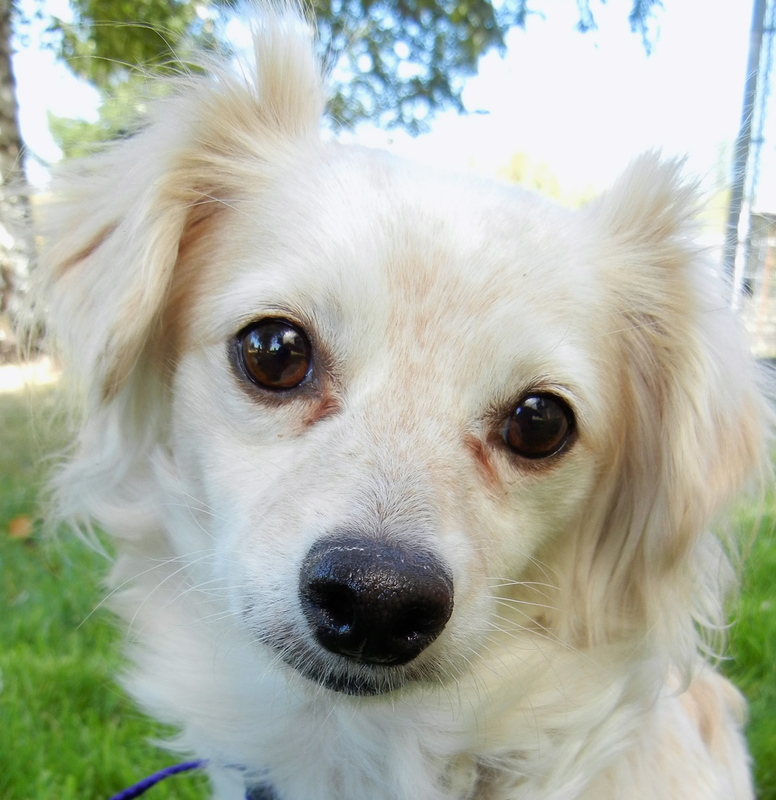 Mamie is three years old and is a Spaniel mix. I’m sad to say that today was Meredith and Kenzi’s last dog-walking day. School is starting and they have to give up their shift. They have been such loyal Wednesday team members and dog lovers, I will miss them! Here is how Mamie looks without her cone. I don’t understand why I have to wear this cone thing! I felt sorry for Opal today, as she, too, has to wear a cone because of being spayed. She is a very shy girl and having to wear the cone made her even more nervous than usual. 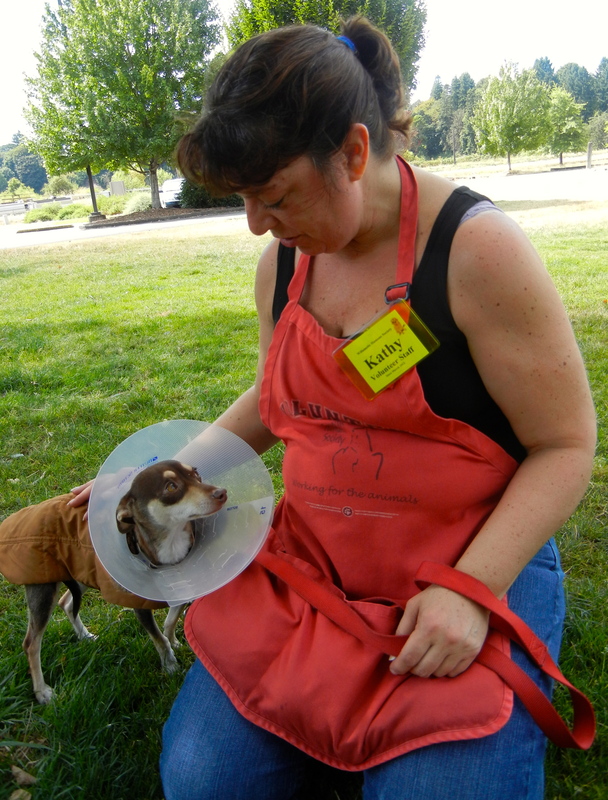 Volunteer Kathy took some special time with her to help relax her. 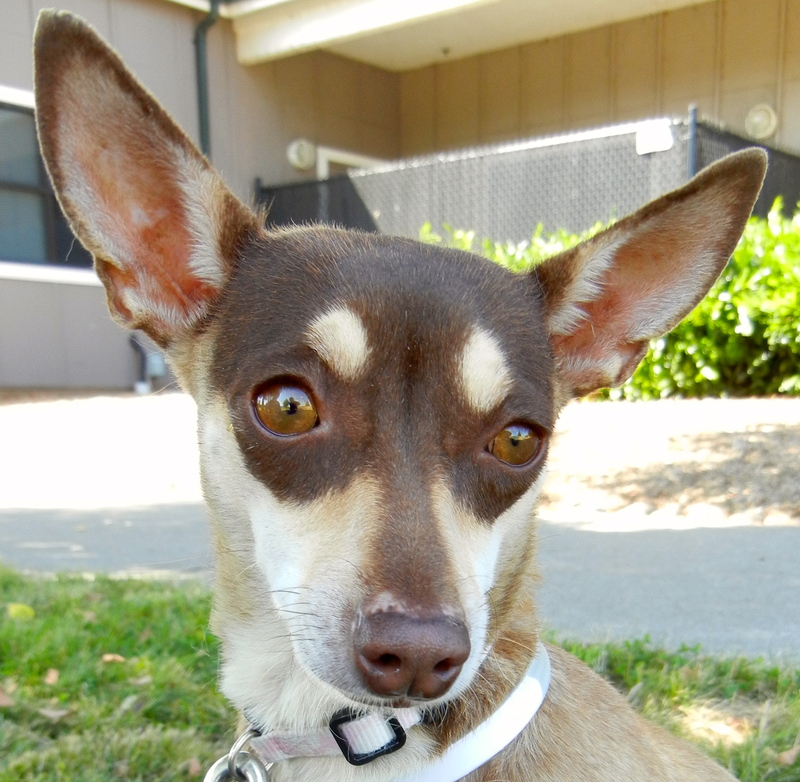 Opal is a two-year-old Chihuahua/Miniature Pinscher mix. She will need an understanding and patient family to help her gain more confidence. She has a beautiful face. This is how she looks without her cone. We’re a couple of old ladies looking for a retirement home! 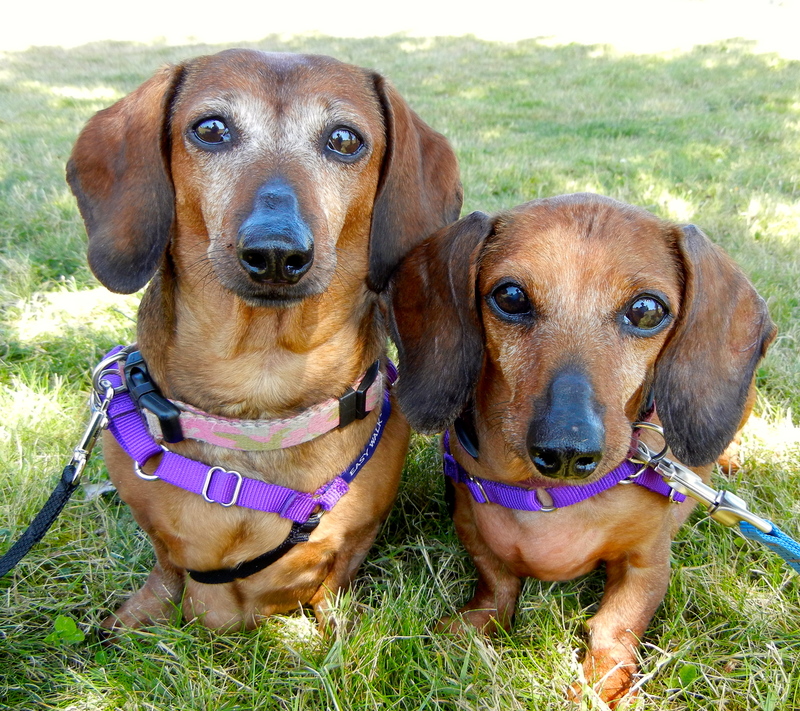 Lastly, I’d like you to meet Annie and Tootsie, two older best-friend Dachshund mixes, who are hoping for a home together. Annie is twelve and Tootsie is ten. They have both had a little age-related surgery, so are wearing matching “tires” for a little while. 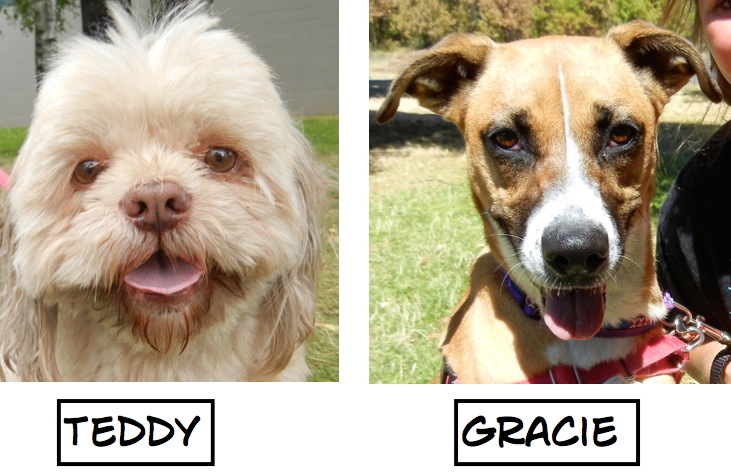 They love to snuggle and except for some short walks, would love to just settle in with their people. Here they are today with Emelynn and Traci. This is the way they normally look. So that’s it for this week. I’m hoping for many more adoptions to report next post! Wish I could adopt them all! Liftoff was my favorite this week. 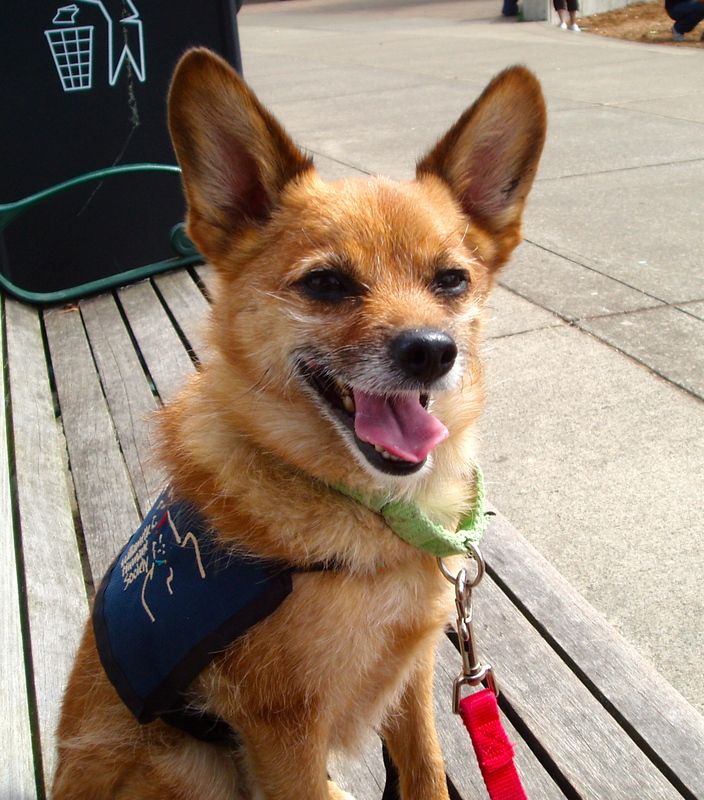 Nice dog for an active family who likes a dog with a nice personality who loves to fetch. He is a quick learner at sit, etc. Of all the dogs I walked in my volunteer shift today, he was my favorite, although a couple of the pit bulls were the most cuddly and lovable (unlike what many think). Martha, I just wanted to comment on how much I have noticed your growth as a photographer since your Statesman Journal days! You capture not only the essential dogginess of our furry friends, but our love for them as well. Your shot of the four running dogs is especially moving. It is now my new desktop background.